Get more information from Marion herself! Request an invoice to submit payment! Marion Grodin is a true comedy veteran with almost twenty years in the business. She is one of the hottest comics working today, Headlining all over the country, as well as being a regular at Standup NY and Gotham Comedy Club. Her quick wit and extraordinary ability to improvise makes her one of the best! Marion has opened for Lewis Black, Judy Gold, Robert Klein, and Linda Ronstadt. She has appeared on the View, the Conan O’Brien Show, and Live at Gotham on AXS TV. She also wrote a Memoir — “Standing Up: A Memoir of a Funny (Not Always) Life” and went on a 35 city tour performing standup! In addition to being a spectacular standup comic, Marion has sold six screenplays and written for two sitcoms. 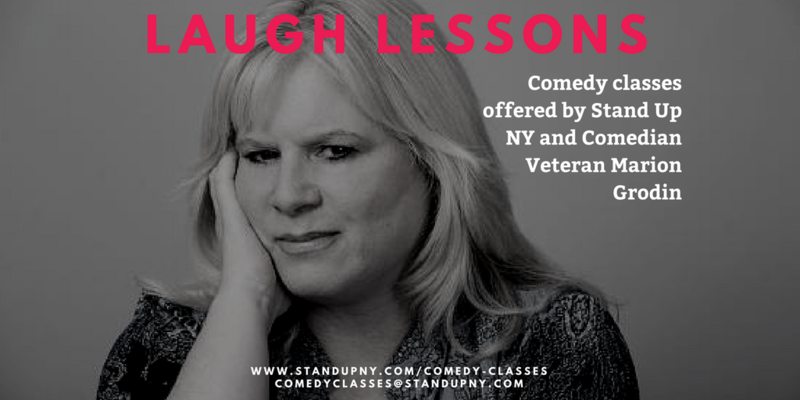 Laugh Lessons is a six-week class, that caters to every level of standup comedian. This class is ideal for beginners as well as for more advanced students, as Marion will tailor-make her feedback to each student’s assets and liabilities. Marion will work on each comics 5-minute set focusing on writing, joke construction, perfecting punchlines + more! The class will culminate in a performance on the stage of Stand Up NY. Each student will be able to get up in every class and will receive feedback from Marion. You will also receive feedback from the other students, in a safe environment that is judgement free – only allowingfor constructive feedback. Students will benefit from Marion’s background as a writer, and her phenomenal improvisational skills!